Hmm, okay, so how can I explain this to you? A Twix-moa is like the love child of a Twix and a Girl Scout Samoa cookie. Or maybe it is a candy bar dressed up like a cookie. It might also be a cookie transformed into a candy bar. I guess I'm not really sure what a twix-moa is, but I'm pretty sure it's a thing. Or we're going to make it a thing. Yes, I clearly took her idea and ran with it. Yes, I could probably still track down some Samoas, but let's be real here: Girl Scout cookies aren't what they use to be. And yes, I could probably spend an afternoon lovingly baking my own Samoas. This may not be my finest culinary moment, but I feel like you need to - No, you have a right to know about it. For 6 Twix bars: Toast 3/4 cup sweetened coconut over medium high heat until golden brown, 5 to 6 minutes. Remove to a microwave safe plate and set the bars in coconut. Microwave the entire plate for 20 to 30 seconds, just until the chocolate softens. 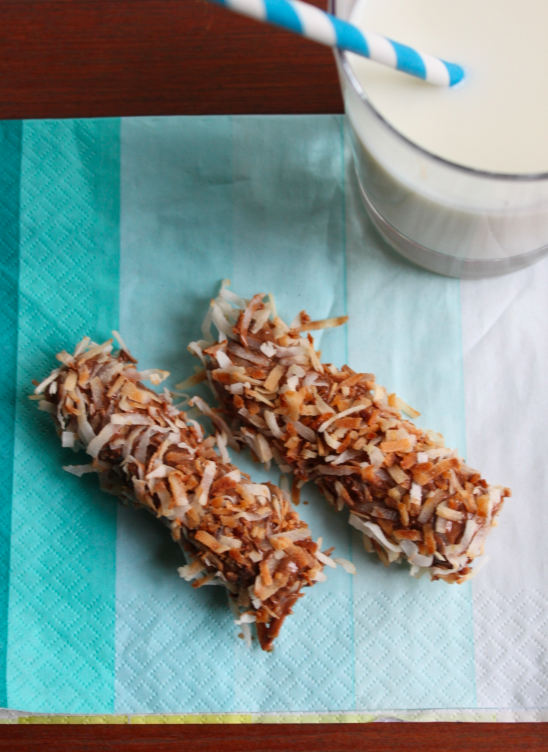 Use a fork to roll the bars in the coconut until completely coated and refrigerate for 15 to 20 minutes of until set. 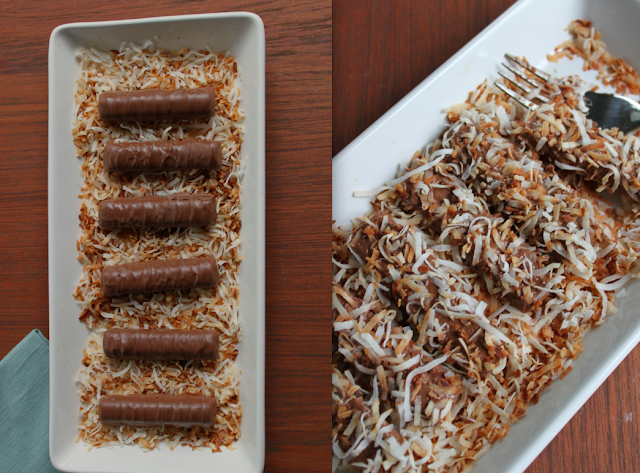 Also did you know Coconut Twix were a thing? Yah, now you know. whoa! be still my sweet-toothed heart! such an awesome idea and beautiful execution! twix moa is tasty in taste.